Renal cancer is often asymptomatic disease in the early stages, which means that 1 in 4 patients only discover the tumor in very advanced stages, since no possibility of treatment for healing purposes. It is estimated that in Brazil, the annual incidence of kidney cancer is 1 case per 10,000 population. The clear cell carcinoma usually appears in individuals over 50 years of age, the age of the average being at diagnosis around 64 years. This type of cancer is uncommon in people under 40 years. Men have 50% more risk of developing this type of tumor. Currently, at diagnosis, approximately 55% of patients experience tumor restricted to the kidney, 20% already have regional intrusion signals, usually lymph nodes around the kidney, and 25% are already in an advanced state, with metastases to other organs such as liver, lung or bone. The greater the number of risk factors an individual has, the greater your risk developing cancer have lifelong. This does not mean, however, that people with many factors will necessarily have cancer, or that people without risk factors are completely free from the risk of developing this tumor. 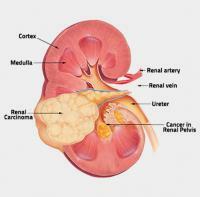 Kidney cancer is a tumor that can remain asymptomatic until advanced stages of the disease. Currently, almost half of tumors are diagnosed accidentally when the patient performs an imaging study of the abdomen, such as ultrasound or CT scan, for any other reason that has nothing to do with cancer. Hematuria (blood in urine) - The urinary bleeding may be microscopic or macroscopic. In the second case, the clot formation is common. Palpable abdominal kidney affected side mass. Varicocele (varicose veins in the scrotum) - Varicoceles that arise in the elderly, especially the left side, should always turn on the warning signal for the presence of a tumor in the left kidney. The classic triad of symptoms of kidney cancer described in older books is composed of low back pain, hematuria (blood in urine) and a palpable abdominal mass. However, the presence of three signs and symptoms at the same time is not common and is found in less than 10% of cases. Anemia - may be present months before diagnosis and often disproportionate to the stage of the disease. Fever with no apparent cause - It is often accompanied by night sweats, fatigue and weight loss. High blood pressure - occurs in tumor production of hormones that increase retention of salt and fluids. Hepatic dysfunction - Call Stauffer syndrome, occurs even without the existence of metastases to the liver. The most common findings are elevations of SGOT, SGPT and alkaline phosphatase. Hypercalcemia (high blood calcium) - It may be due to metastatic lesions to the bones or tumor production of PTH hormone. In general, kidney tumors are discovered by radiological tests such as ultrasound or computed tomography of the abdomen. With the popularization of these tests in the past decades it has been increasingly common to discover renal tumors accidentally. The patient will do an ultrasound of the abdomen to evaluate a non-specific abdominal pain and finds out that there is a small tumor in his kidney. It is important to note that not all existing mass in the kidney is a malignant tumor. simple renal cysts, for example, are extremely common injuries, especially in people over 50, who have nothing to do with cancer. However, some kidney cancers may have a similar appearance to that of a cyst, and difficult to distinguish by ultrasound. In general, every time the radiologist comes across a suspicious cyst, he describes him as "complex cyst" and indicates conducting a CT scan or MRI, exams that are better able to distinguish cysts from malignant tumors. CT scan (or MRI, if the patient has a contraindication to the use of iodinated contrast media) is a test that currently has excellent ability to identify malignant tumors of the kidney. In most cases, the image provided by these tests is so good that it is not necessary to renal biopsy to establish the diagnosis. Only with the result of the scan, the urologist may decide to nephrectomy (surgical removal of the kidney). The CT scan is not only able to identify kidney cancer, but also serves to stay it by setting if there is local tumor invasion or distant. Once kidney cancer is diagnosed, the next step is to determine at what stage it is, a process called tumor staging. Staging is a system used to describe the size, aggressiveness and degree of cancer spread. Knowing the cancer stage helps guide treatment and predict the long-term prognosis. Existence of tumor invasion of blood vessels near the kidney or lymph nodes. Existence of metastases to other organs. Stage I - Tumor less than 7 cm and limited to the kidney. Stage II - Tumor larger than 7 cm but still limited to the kidney. Stage III - Tumor of any size, but with involvement of at least one ganglion near the kidney, the renal vein invasion or perirenal fat. Stage IV - Tumor invades the adrenal gland or already present metastases to other organs such as bone, liver or lungs. The higher the stage of the tumor, the more advanced the disease is and the higher the mortality. When the patient is diagnosed with a tumor in stage I, it has 95.4% still alive after 1 year and 80.9% after five years. Moreover, patients with stage IV tumor have survival of 34.2% in the first year and only 8.2% are still alive after 5 years. The percentage survival in the first 5 years for each tumor stage can be seen in the table below. Tumors with stage I, II and III are considered localized tumors and treatment aims to cure. Obviously, cancer patients in stage I have a much better chance of being cured than patients with stage III. Tumors in stage IV, in turn, are advanced tumors, practically no possibility of healing. In these cases, treatment is intended to increase survival and improve quality of life of the patient. 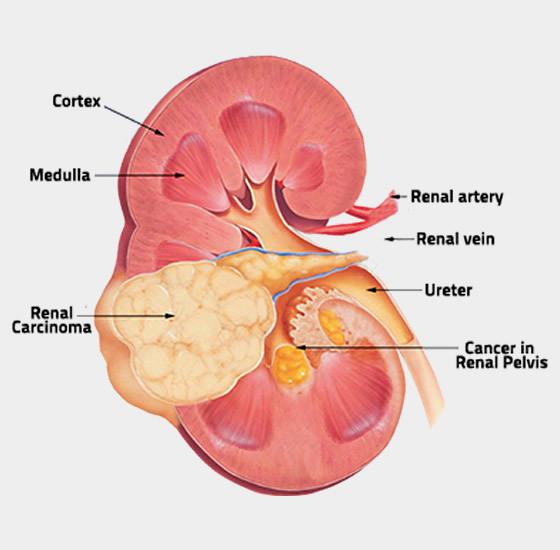 The nephrectomy (surgical removal of the kidney, adrenal gland and regional lymph nodes) is the recommended treatment for patients with kidney cancer in stages I, II and III. In patients with stage I tumors with less than 7 cm, nephrectomy may be only partial, for removal of only part of the kidney where the tumor is found. The smaller the tumor, the more secure the partial nephrectomy. If the patient is elderly and its surgical risk is high, a non-surgical option for cases of small tumors is the destruction of it by heat or freezing procedures called, respectively, thermal or cryotherapy radiofrequency ablation. These procedures are performed by special needles, which are inserted through the skin to the kidney. In very elderly patients with life expectancy already very low regardless of cancer if the tumor is less than 2 cm in diameter, the best approach may be to do nothing, keeping only half-yearly monitoring of the tumor with CT. As small renal tumors grow slowly, it is more likely that the patient will die by reason other than cancer. Thus, the patient need not be subjected to the risk of surgery. Patients with stage IV kidney cancer are usually treated with a combination of surgery + drug treatment. Unlike most cancers, does not use chemotherapy in the treatment of kidney cancer. Surgery to remove the kidney and their metastases usually does not cure the cancer, but may reduce the symptoms and slow the need for treatment with medication. Immune therapy - usually done with a drug called interleukin-2. Anti-angiogenic therapy - Made with medications that reduce the blood supply to the tumor, slowing their growth. The most commonly used drugs are: Sunitinib, axitinib, sorafenib or Pazopanib. Molecular Targeted Therapy - Drugs that directly inhibit cancer growth. The most commonly used are: Temsirolimus or Everolimus. Renal tumors with stage IV are very difficult to heal. When there is only one distant metastasis, nephrectomy associated with metastatic resection this may lead to cure in some cases.